Celebrating the life of Carlos Sebastian! He was one of the most committed members of our FCJ Refugee Centre’s community, through his dedication and commitment with the uprooted people of the world, he managed to help everyone around him that who was in need.Carlos was just Carlos. Carly as was known by his family in Chile and also he was called the same way here in Canada by Francisco. His way to help anyone started and ended with a smile… if any of us came to him looking for help or support of any type, he always was there ready to help. Every time he was at the office you could see him, walking around, saying Hi to everyone, making jokes, talking with people. If the office was quite, he loved to do crosswords. He really believed that to do crosswords was the best way to improve the English skills and acknowledge of anyone, including him. He and at least one his children, were the official bartender for our holiday parties… he always was in charge of making everybody happy without drinking too much. At the end of the party, he always had made the miracle. Plus, there always were leftovers of drinks for the next party. Although we won’t have his physical presence and his heavy smoker smell, our friend, brother, companion… any longer, his memories, his smile… “siempre haciendo camino al andar”, always Carlos being Carlos… that presences of “Don Quijote” always will be with us. Join us in a special act of commemoration of the life of Carlos Sebastian. 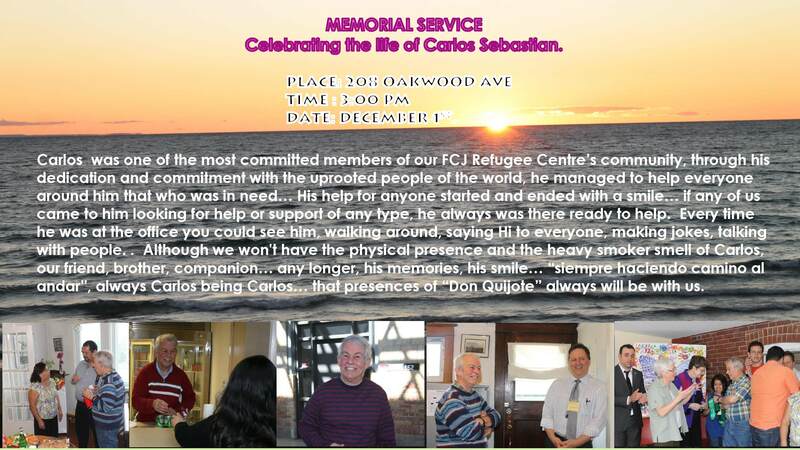 It will be held on Sunday December 1st at FCJ Refugee Centre (208 Oakwood Ave, Toronto) at 3:00 pm.